BitCometLite is an ideal development to distribute large files over the Internet, because it offers you the possibility to create a customized download manager that can be used to download a single file. 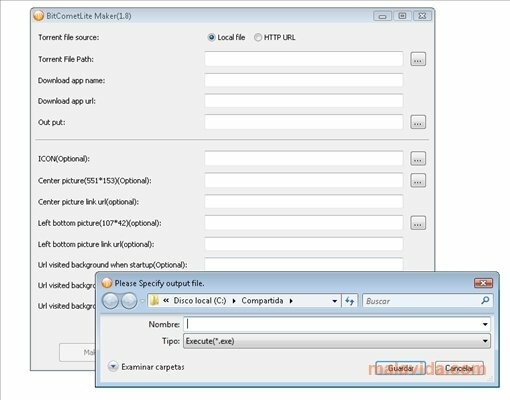 The objective of this application is to create an EXE file from a file stored on your computer together with a Torrent link, this application will automate the download of any contents, from videos and albums, to demos of games and complete programs. The interface is rather simple and, after selecting the Torrent file, you will be able to choose the executable of the icon, several images to customize the interface, the name of the EXE and the output folder of the resulting file. Once the customized download manager is created, you'll be able to send it to any contact over the Internet or upload it to your web or blog so that anyone can download it. Discover an original and simple way to share files with whoever you want, thanks to BitCometLite.